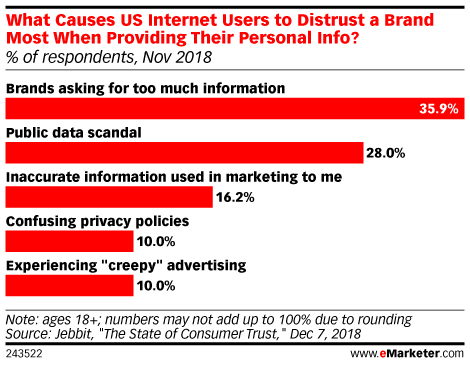 Data is from the November 2018 Jebbit report titled, "The State of Consumer Trust". 1,000 US internet users ages 18+ were surveyed via the Jebbit platform during November 12-22, 2018. Participants were sourced through Facbook, Twitter, Instagram and Amazon's Mechanical Turk and were offered more relevant offers and services in exchange for their personal data. Jebbit is a data platform that enables brands to collect relevant consumer data through mobile experiences.